Home»Cooking, Cleaning and More»Adventures in Cooking»"I Love School" Lunch Boxes»Let Your Kids Make Their Own Sushi Bites for School Lunch! Let Your Kids Make Their Own Sushi Bites for School Lunch! Last week I showed you how to make sushi for school lunch. This week the kids can make their own! Roasted Seaweed has been all over the grocery stores lately. My kids eat it as a snack and I cannot refill the pantry fast enough. The seaweed is like the nori on sushi, but is crunchier and more flavorful. Last week I found my son making his own sushi bites with leftover rice, veggies and seaweed… and we had a new lunch box idea! To make it, I followed my rice ball instructions. Just cook sushi rice and, if you want an easy shape, scoop it out of the rice cooker with this Heart Rice Spoon . 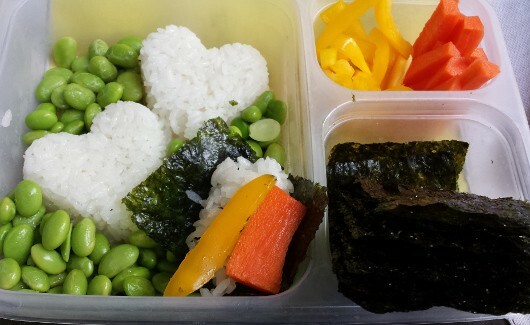 I put the rice in the lunch box with the roasted seaweed, sliced peppers and carrots and edamame. In the lunch room, the kids were able to put together their little sushi bites as they ate!